Replacement Muffler for VAC-U-MAX Air Operated Vcauum Cleaners and Venturi Air Driven Power Units. The VAC-U-MAX 01376 Muffler is designed to keep your VAC-U-MAX Air Operated Vacuum Cleaner quiet and within OSHA noise level standards. We recommend that the muffler be replaced several times per year based on use of vacuum and quality of the compressed air. ATEX-Certified Air Powered Industrial Vacuum, 55 gallon, 100 CFM, Pulse-Jet Filter Cleaning Vacuums for Class II Div II Environments Model 40012. 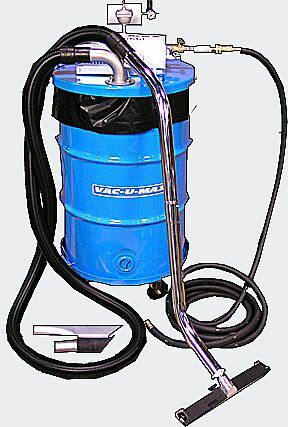 VAC-U-MAX 55-Gallon Air Powered Industrial Vacuum, Model 40012 for Class II, Division 2 environments is completely grounded and bonded to meet the NFPA 70 requirements for grounding and bonding. These vacuums also meet the definition of an "intrinsically-safe system". VAC-U-MAX air-powered vacuums do not use electricity and do not generate any heat from operation. Adjustable orifice assembly for vacuum control 8" Hg. - 16" Hg. Extra Large Static-conductive PTFE(Teflon) coated washable internal dust filter rated 99.9% efficient @ 1 micron. Tool Kit Universal, includes 2-bend floor wand wheeled floor tool, crevice tool and utility tool with rubber nozzle. This package does not include a vacuum hose. Please consult factory when selecting proper material transfer hose at 800-822-8629.